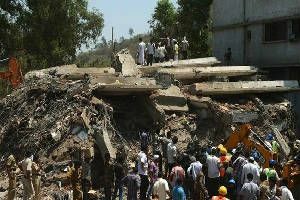 An unauthorized building was collapsed in Shil-Phata area of Thane Mumbai killing 74 people,culprits were arrested and it was found that municipal corporation officials were also involved with builders in completing this seven storey building. Unauthorized buildings were made,they got collapsed,inquiry commissions set up,culprits get arrested , sometimes sentenced to few years of jail and get released to do this again thus this vicious circle goes on. Everybody hopes for a home which one can call his own, builders take advantage of this situation,they provide cheap houses low in quality standards and even get clearance (obviously bu greasing palms of related government officials) thus such incidents happen. Governments are unable to give shelter to each because they themselves wants these builders to flourish as they give huge sum of money in bribes. As far as government housing schemes are concerned which are based on token system usually go to someone related to the official or may be to the officials themselves. Today we are 66 but still we have people suffering from hunger,having no roofs on there heads and die due to lack of proper medical facilities.Who is responsible? always remains a question. May be we all are responsible in encouraging bribes. We offer bribes to ditch long queues or to make our work done before others,sometimes to get some benefit from that officer and sometimes out of habit. The system will change only when we change ourselves. I agree with you. the system will change only when we change ourselves. But the present is like a vicious cycle. There has to be something more than changing ourselves to stop it. May be a false proof govt or stringent policies and better use of technology. There is an urgent need for a true leader who can lead from front and make others do there work sincerely. People will talk about such tragic incident for some time and then they'll forget about it. Again, corruption grows in leaps and pounds coz, people's lethargy. Most of us feel at home with corruption as it helps us to get our things done. It's true Sir but we should not loose hope there is always a light at the end of tunnel.